Hello Sourcers! 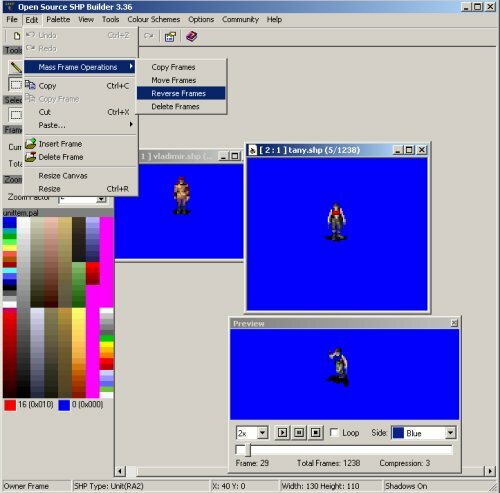 I've released Open Source SHP Builder 3.36, which is a nifty tool to create the 2D art to use on mods for Tiberian Dawn, Tiberian Sun, Red Alert 1 and 2. The main features of this version are the mass frames operations. You can now copy, move, delete and even reverse a massive amount of frames at once (with its respective shadows). The program also includes new ways to export your SHPs as the most common images files, new flood and fill tools, some new image effects and the possibility to paste the content of the clipboard into a new SHP or a new frame. In terms of bug fixing, this version is also very interesting, but removing many problems that 3.35 had with importing GIF files. Also, some critical rendering bugs that existed since the first version of the program were finally tracked and removed. There were many other bug fixes that made the program become much more confortable to the end user. For the full changelog (which is huge this time), check this topic at PPM forums. For more information on all features offered by this program, check its own section at PPM. I recommend everyone to update your OS SHP Builder for this version. You can download it from our Downloads Section. Support for this tool is available at PPM Forums.